As the days get longer in Madrid, there’s nothing better than going for a walk in the city centre and visiting the markets that are scattered around the different neighborboods. Many of the markets in Madrid were traditional fresh food markets and have now been converted into swanky gastro markets. If you still haven’t visited them, make sure you make the time to go and enjoy a nice meal or glass of wine with your friends or family. Keep on reading and learn about some of the most famous markets in Madrid! 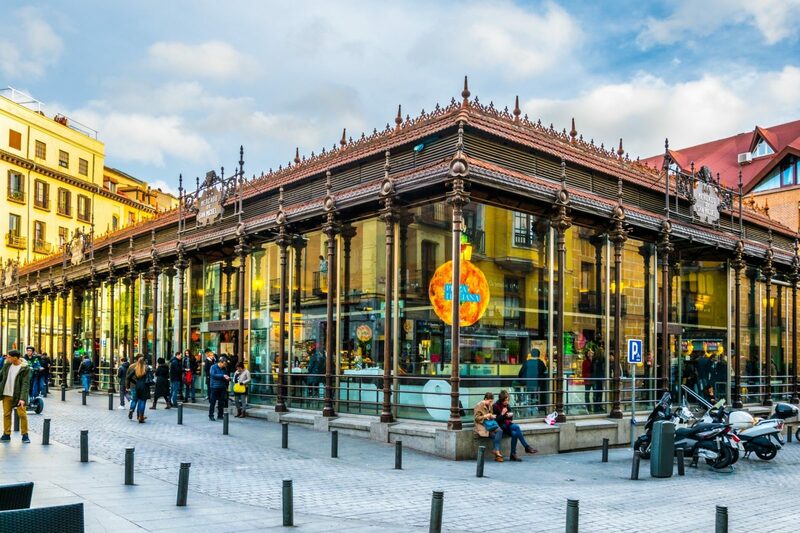 This iron and glass market located just off Plaza Mayor is one of the most famous markets that you will find. It opened in 2009 and it is one of the liveliest culinary spots in the city centre. It is the perfect stop to have a glass of wine or a beer and look around for the tapa that gets your attention the most (there are so many!) Even though it is not the cheapest place you’ll find, it is definitely worth it stopping by, even if it is just to try some of the amazing oysters or chocolates they sell. Located in Chueca, this place is well-known for its nightlife and varied choice of food, which includes typical dishes from all over Spain – from Asturian tapas to Basque. On the top floor you will find a wonderful restaurant and a bar with amazing views that offers some of the best gin tonics in the city! In the centre of Malasaña you will find this alternative market, well known for its drinks and snacks at any time of the day. Not only will you be able to choose food from 18 different stalls and drinks from three different bars, but you will be able to enjoy them in a fantastic terrace! In the cultural neighbourhood of Huertas you will find one of the most traditional markets in the city, which opened in 1941. Here you will be able to have lunch, shop, have drinks, buy organic stuff, buy gifts, do a language exchange or sign up for cooking lessons, among many other things. They basically have a bit of everything so it’s a must visit! Built in 1930, this market is well known for its architecture and for its fresh food. They recently started selling takeaway food and serving meals for you to enjoy there. Very local market, with good prices and a familiar atmosphere. Located in the international neighborhood of Lavapiés, this market sells everything from books to fresh food and clothes and they also have really interesting workshops. Inside the market you will also find the health centre, so maybe if you live around the area and need to visit the doctor, you can kill two birds with one stone. Have you been to any of these markets yet? Let us know what you thought of them! Leave a comment on our Facebook!